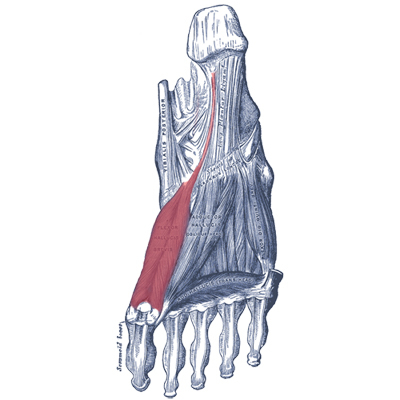 The Extensor Hallucis brevis (EHB) is a muscle on the top of the foot that helps to extend the big toe .It is essentially the medial part of the extensor digitorum brevis muscle. From the distal part of superior and lateral surface of the calcaneus ,lateral talocalcaneal ligament and apex of inferior extensor retinaculum. To the dorsal surface of the base of the proximal phalanx of the big toe. Nerve supplied by the lateral terminal branch of the Deep Peroneal Nerve (deep fibular nerve). The proximal sciatic branches S1 and S2. Deep peroneal L4 ,L5 , S1 . Extend the metatarsophalangeal joint of the big toe. Strains of the EHB are common. Some of the symptoms that may help point towards a strain include; pain right at the top of the foot and near the toes, difficulty in raising the foot upwards, feeling of numbness in the foot, big toe pain and deformities (clawtoe or hammertoes). Common causes of a strain are; frequent stubbing of the toes, repetitive kicking and cycling.